The HC is designed for indoor installations only. The chosen location must have Wi-Fi coverage. Wi-Fi coverage can be easily tested using a smart phone with Wi-Fi connectivity or on the HC itself (signal strength is shown when you select a wireless network). 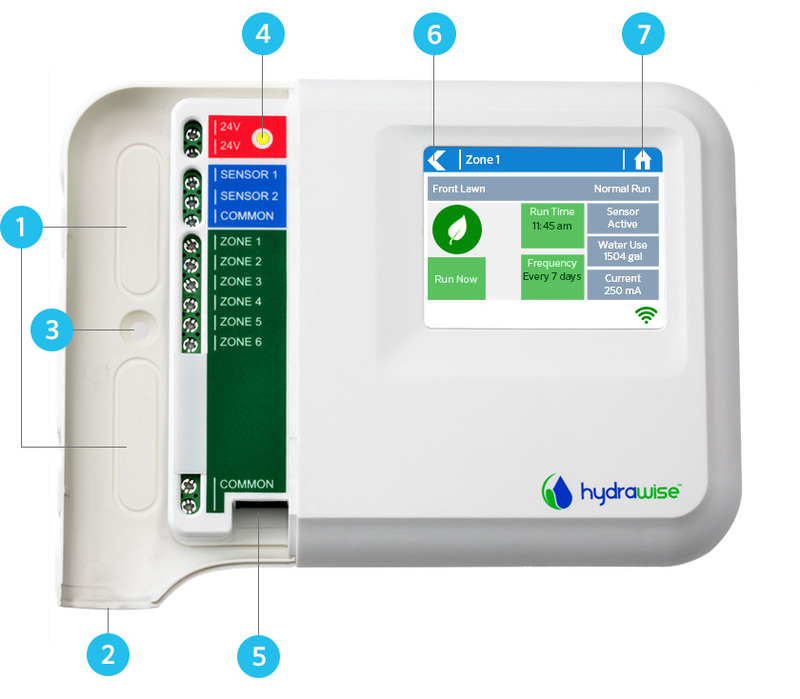 Note: The HC Controller is an indoor model and is not water-proof or weather resistant, and must be installed indoors or in a protected area. Note: Do not plug transformer into power source until controller is mounted and all wiring has been connected. The controller has 2 cable entry options -- from the rear of the case or via a conduit from the bottom of the controller. Using a sharp knife, remove the 2 cutouts on the rear of the controller as indicated on the diagram as . Using a sharp knife, cut around the semi-circular line on the controller as indicated on the diagrams as . Cut around the matching line on the blue controller wiring cover. Using a drill bit of 3/16 inch diameter, drill a hole to a depth of 1 inch (25 mm). Insert plastic anchor so it is flush with the surface of the wall. Screw 1 inch screw into plastic anchor leaving the head protruding about 1/8 inch (4 mm). Slide the controller case over the screw head. Mark second mounting point (see in diagram), remove controller, drill hole, insert plastic anchor, slide controller case over first screw head and screw into place.